The late, great, legendary film critic Roger Ebert opened his review of my favorite Spider-Man film, Sam Raimi’s Spider-Man 2, with the line: “Now this is what a superhero movie should be,” a sentence that feels pretty appropriate to use today when describing the first of, likely, many theatrically released Sony Pictures Animation Spider-Man-related films because Into the Spider-Verse is a special movie in virtually every way imaginable. How Long Will Spider-Man Be in the MCU? It has been a lot of fun being a big fan of Marvel’s favorite wall-crawler since Marvel Studios and Sony agreed to ‘bring Marvel into the amazing world of Spider-Man’ back in February 2015. Since then we’ve seen this new version of Peter Parker appear in Captain America: Civil War where he stole Steve Rogers’ shield for a minute, and that was probably one of the best on-screen moments ever for the character. I am, by no means, a big fan of the Captain Marvel character, but I appreciate the love a lot of fans have for her. Still, this character means more to me as a result of this blog. The very first Marvelous Monday, way back in January of 2015, was about who could play Captain Marvel. I wrote about Katee Sackhoff, Emily Blunt, and Yvonne Strahovski. Now, we’re hearing that Brie Larson, star of Room, is in talks to star as Carol Danvers. Why is Marvel going for Larson, and why are we hearing this now? 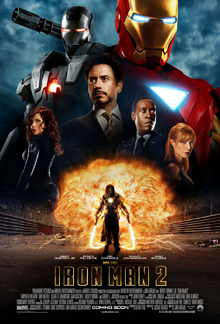 The following is a retro review of Iron Man 2, a Jon Favreau film.